I ate according to the autoimmune protocol for a month before leaving for the Low Carb Cruise. Which means on top of not eating grains, legumes and dairy I left out nightshades (usually hot spices and peppers, tomatoes etc), but also eggs, nuts and seeds. Why did I do it? I wanted to experience the needs of the autoimmune paleo community and because a few close friends in the paleo world think I have adrenal fatigue (I’ll get tested to know for sure) and needed to work on gut healing. I’ll tell you more about why they felt I had adrenal fatigue in another post. paprika? I never realized it before but I use paprika in a lot of dishes! Realizing this made my life easier…the results of working on gut healing showed up really fast! *When you take out eggs/nightshades/nuts/seeds because these can be gut irritants you create an easier environment to achieve gut healing (read Gut & Psychology Syndrome for a deeper understanding). You can add these items back in stages if your focus is gut healing. How did I know gut healing was happening? You can tell in your mood (happy because your making happy chemicals), skin gets better faster, in your bowel movements (if you have the Practical Paleo book look at the Guide to: Your Poop! on page 75 and aim for Miss Ideal. Here’s how I tackled breakfast. I found you can’t wake up and make breakfast like you used unless you have fresh protein in your fridge or it is thawed out. I needed to plan breakfast for the first time (eek!). I made batches and batches of pork/chicken/beef breakfast sausages and other days I would eat liver. I made the sausages small so I could easily fry them up in a frying pan frozen. The plan worked perfectly! Here’s the recipe I made for pork sausages. p.s. I used the same recipe for ground chicken too! 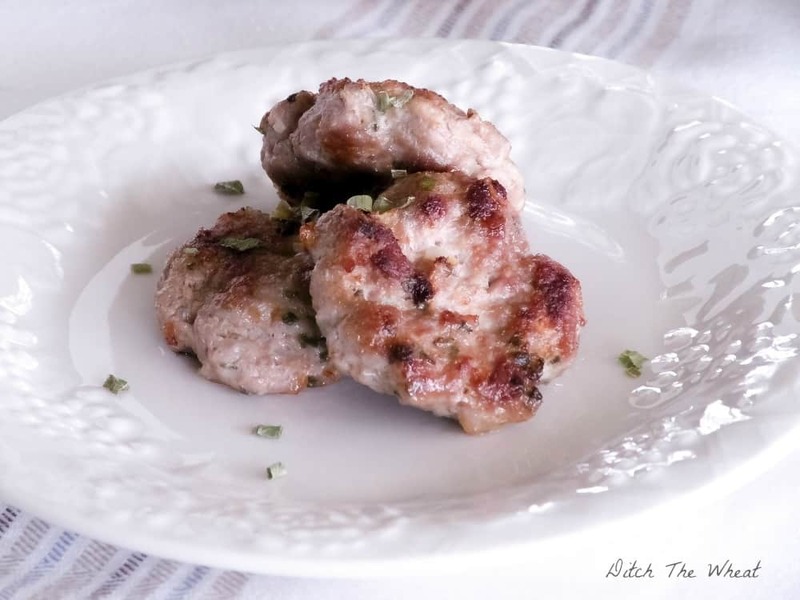 Mix and mold into mini patties. Cook on medium. Makes 8 mini patties. 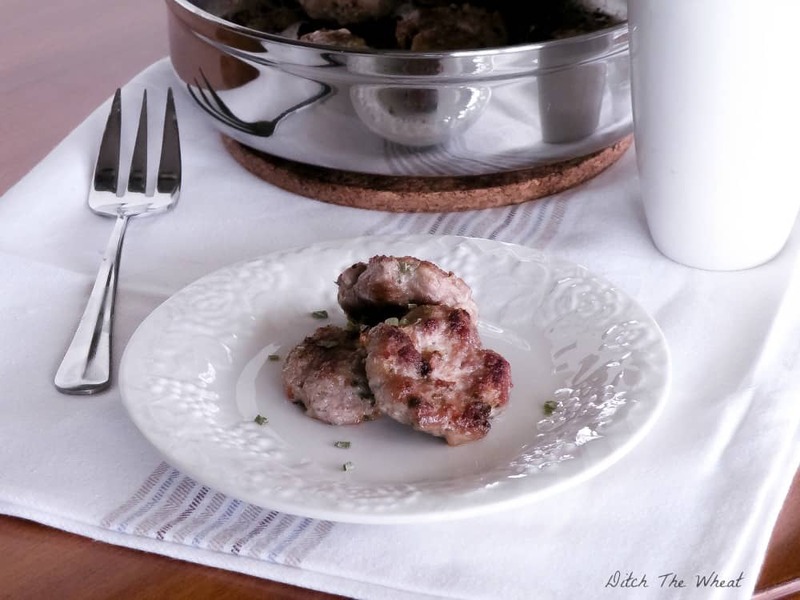 *I make bigger batches and freeze the sausages for a quick breakfast option. p.s. you know people who claim after 30 days or more a food sensitivity is gone when they do a gut healing protocol. Well, usually I have problems with dairy. On the cruise each evening I ate ice cream since it was the only gluten free option. Guess what! I didn’t have the problems I had before….I guess there is something to this gut healing after all 🙂 *Seriously read Gut & Psychology Syndrome for a deeper understanding. p.p.s. check out this cookbook, Autoimmune Paleo Cookbook, for lots and lots of autoimmune friendly recipes that covers breakfast, lunch, dinner, snacks and DESSERT! Yum, these look good. What kind of oil would you use to cook these? Do you freeze the sausage cooked or raw? Thank you.